He was wearing a small trenchcoat and looked a bit like a pint sized Robert Redford, with a clichéd shock of blond hair and an open and engaging impish face.But his shoes! His shoes were black, patent-leather-shiny treads with sharply pointed toes and impossibly long. At least a half size again and rising slightly at the bow like those pixie shoes we all imagine those creatures wear. He was with two friends and they flagged down the Drug Arm bus. We stopped and chatted for a while. They were sober and were simply walking around this beach village because they had nothing to do. They were smartly dressed, fashionably so. His impish grin and self confidence was engaging and we found ourselves talking about school plans (for exclusive private schools), parents and politics. He was in Year 9 and his two friends in Year 12. Articulate. Informed. Aware. Opinionated. Self assured and self contained. Headed home with friends to watch DVDs. Our team hit the streets again last night and we patrolled the northern beaches, checking out some new sites and visiting the well known haunts of kids (and older) who find themselves at a drunk or high loose end on Saturday night. It was very quiet, even though the weather was decidedly warmer and the wind had dropped. In fact the ocean was almost a dead calm. We soon found our way down to Manly where we found a police car camped at our usual park. We pulled in beside them but the police are a sure fire deterrent to kids who might want to talk to us about drug and alcohol issues. They left after a few minutes but “traffic” was still slow. Then we were treated to two highlights. The first had nothing to do with what we were doing but was merely a factor of being where we were – as we watched the surf we noticed that with increasing frequency waves were being lit from inside by what looked like lightening strikes of green light, Some incredibly bright and spectacular shows. Bio luminescence at work. I have never seen any thing like it. And I had never seen anything like the large woman who, with a complete skinful, in her late forties or so – hard to tell sometimes – turned up with her battered scallops clasped in one hand and in a drunken rasping voice asked for a cup of hot chocolate. As I was whisking that up for her she decided a hot drink was not enough and asked for a cuddle. My colleagues were appalled. I had to decline this advance, which was followed by a few more requests, on the basis that cuddles were only issued on week days, not weekends. As she processed that we quickly packed up and did a bolt up the road to where earlier we had seen a group of kids. Drunk teenagers, one of whom then tried to steal our light, were a far safer proposition than her insistent overtures. And we were able to share with them our wonder of the sparkling, glowing surf. Our first “patrol” for 2007 this evening. At the end of a week in which our press announced the largest discovery ever of ecstasy chemicals – worth more than $500million. Apropos nothing except we are out there aiming to do something to ensure people on the other end of that drug pipeline have the means to extract themselves from its seduction, or avoid it altogether. There is simply no rhyme or reason to where and when we might have contact with people – mainly teenagers, but ranging right through to the elderly homeless person. At the height of summer, you would think that there would be plenty of young folk out and about. But even the bus stops were deserted and our regular haunts turned up nothing. We suspected that we are experiencing some post Christmas and New Year lull. Here are some of our crew at one of our regular stops. The best we got here were adult couples heading home after dining at the local restaurants. But some of these stopped to ask what we were doing and were very complementary when they found out. That little pat on the back goes a lot further than they would imagine. After numerous other stops on our prowl around the beaches we stopped at the place we met “Shrek” a few weeks ago. See previous blog. By now the wind was whipping off the ocean and we were feeling the cold (!). 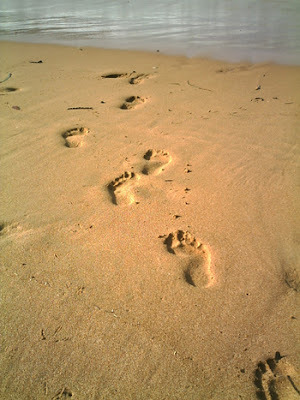 But we soon had young people emerging from the shadows of the beach. The wobbly shot is appropriately blurred – not sure if many of those we help would appreciate too much clarity in these photos. Two young fellows were keen to have as much milk as they could – to assist a friend high on ecstasy. You are never sure about the veracity of these claims (is there a friend? is there a high? is it ecstasy induced?) but this is not an exercise in passing any judgement whatsoever. So they happily jogged off with two or three cups of milk. In the end a quiet night which started out with the prospect of no interaction whatsoever but saw us help our milk fiends, chat with a group of wandering girls, have an interesting discussion with a young man from the Sudan (out for a stroll), assist a mother and her two boys, laden down with camping gear and fishing rods, looking for a camping ground (- at midnight!?) and interact with a group of young men. A quiet start to the year but not atypical in the range of demographics that we engage. <?xml:namespace prefix = st1 />Sydney press of late has drawn our attention to the rising problem of drug use in our city (an example here), in particular calling attention to methamphetamines, or ice, which are becoming increasingly pervasive. Rightly so – the press attention that is. On the Northern Beaches of Sydney there is a volunteer based group which is part of the national Drug Arm initiative. A Street Outreach Service (SOS) is staffed by volunteers who provide a free referral service for those who want to, or need to seek assistance for drug related problems. That service travels the beaches on Friday and Saturday nights, stopping at regular “hot spots” where young people may, or may not congregate. It is bit of a hit and miss affair – some nights there seem to be young people everywhere. Other nights you could carpet bomb the region and not hit a single kid. I am no expert on drugs. 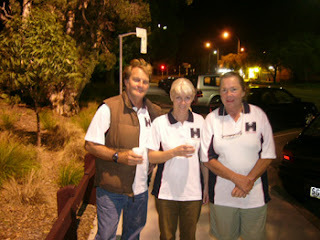 But I get out as a team leader of the Northern Beaches SOS every few weeks. This is not a commentary on the drug scene up here. Rather I want to share with you something much more positive and encouraging. I thought I would share something of last Saturday evening which is pretty typical of a “busy” night out (sometimes new volunteers wonder what they have gotten into when they start and the streets are deserted!). What I really want to do is give you a snapshot of the kids we meet. They never fail to surprise and impress me. We want to make negative assumptions about packs of kids roaming the streets. But they are unfailingly polite, considerate, appreciative, humorous, wise and invariably sensible. And as a pack they are always looking out for each other, a characteristic to which I am especially attuned for some reason. 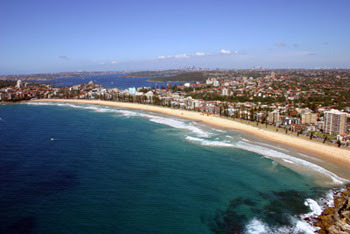 Sydney weather was unusual – it was raining a drizzle which was steady and consistent. But not cold. 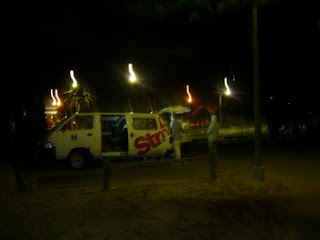 We pulled our van into a carpark at a surf club. We could see shadows moving through the trees, a group of five or six teenagers had crossed the road in front of us as we drove into the area, while another group had waved at us and called out to “the Milo (hot chocolate) van” to stop. Clearly there were a few kids out and about and this seemed like a good place to stop. 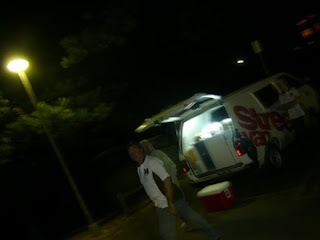 Armed with Milo and sweets and biscuits, as well as hot water, we open up the van and make a few drinks for ourselves. It is a convenient tactic which helps make it look like we are busying ourselves and are not especially looking for them Soon a couple of young boys step out of the shadows and ask if they can have a drink. They are like the first wildebeest that tentatively nose into a waterhole to see what danger lurks. If not devoured by a crocodile they disappear into the dark with their drinks and soon there is a steady trickle of less adventurous visitors who gather around the back of our van chatting, drinking, eating and otherwise being very engaging. Fresh faced, clear eyed, bleached hair, surfers. Not so clear eyed and more grungily dressed – the counter surfer culture (another story in its own right). Some clear headed and alert to the dangers of drugs. Others on that bold animated alcohol cheeky high that gives them a forwardness which can be both humorous and disturbing. That a fifteen year old should be so drunk is not world shattering news. But when you eye ball them and when they are being open with you about what a mess they are in at such an early age, it is a little more confronting. So the patter goes and I listen to a young girl talk about her concern for a friend who is keen on taking drugs. There is a real fraternity among these kids growing up together here. The boys display a respect and honour for the girls in their group, while the girls always seem discrete and full of self confidence. They never fail to impress me with their composure, wisdom and wit. One of them comments on how, in this conversation about drugs (that had arisen from the concern expressed about the girlfriend), we were not being judgemental in any way. Perceptive young chap – that is a key objective of ours as we hand out literature on ICE (and other drugs) and give advice on what resources they can access. Education, referral, a listening ear – and no judgement. Part of me admires the freshness and honesty and beauty of this youthful demographic and the carelessness and irresponsibility with which they live. It is honest and open and frank. Standing in the rain caring less about how wet they are and enjoying a hot drink and chewing the fat. Another part of me is a little more grey, knowing that it won’t be long before that freshness is tarnished by all the less savoury bits that life has to offer. From the direction of the beach and with a backdrop of dark and booming surf a young fellow appears. Drunk. Very drunk. Can of flavoured spirits in his hand. A very humorous drunk as it turns out but also very conscious of his parlous state – which he tries to justify by projecting onto us. “Don’t tell me you weren’t drunk and doing drugs when you were fifteen?! !” Com’n, com’n ya kin tell me”. A tall girl with model good looks tells him to shut it – in the nicest way of course. “Please!” And “Thankyou.” Or, rather “Thanks heaps” or “thanks so much”. That always surprises me. Terrific manners. Always appreciative. We don’t do this for the thanks but we never have to ask for it either, or rue not getting it. It is always there and its ready proffering is partly what makes this so enjoyable. The clear eyed, sandy haired surfing types start to congregate and mix less freely as the more resentful and grungy types gather in greater numbers. The dynamic shifts slightly – but not in a hostile way. The non surfers detest the surf population and insist they are made to feel inferior by those who surf. They mock the surf set and the 6am rise for “an early”. But everyone still mills around in good humour, some drunk, one or two others possibly on the down side of a drug dose. Suddenly a shambling behemoth appears under a nearby street light then turns into shadow again as it approaches. I have to look closely to see what it is. As it trundles in from the darkness someone yells out “Shrek”. A good natured giant kid (he is enormous!!) who makes them all laugh but is probably torn inside, materialises beside the van. Our model good looks warns us to lock away the food – not an idle warning as it turns out, since Shrek proceeds to load up the pockets of his jacket. Clearly under the influence of something, he has to prop himself up on the van as he cleans out our stock. Giant. But placid. And once again the subject of fraternity concern as I hear a couple of mates check up on him and his wellbeing. Quietly done so as not to embarrass him, but direct and honest. And he is direct in his reply. These kids always amaze me. They are not mine but in a strange sort of way I am proud of them.